Situated on two of the most beautiful beaches on the island of Mahé, overlooking the marine national park of Port Launay, Constance Ephélia Resort in the Seychelles enjoys a unique location set within 120 hectares of land with luxuriant and rare vegetation. - Junior Suite: 184 suites (62m²). For a maximum of two adults + one sofa bed (child under 12 years). - Senior Suite: 40 suites (80m²). For a maximum of two adults + one sofa bed (child under 12 years). - Family Villa with private pool: 12 Villas (350m²). Has three bedrooms (one Twin), for a maximum of six people. - Beach Villa with private pool: 12 Villas (370m²). Has two bedrooms, for a maximum of four adults + two sofa beds (children under 12 years). - Hillside Villa with private pool: Five Villas (120m²). Has one bedroom, for a maximum of two adults. - 3 Villas: (220m²). Has two bedrooms, for a maximum of four adults. - Spa Villa with private pool: 10 Villas (330m²). Has one bedroom, for a maximum of two adults. - Presidential Villa with private pool: (980m²). Has three bedrooms, for a maximum of six adults. All suites feature air-conditioning, ceiling fan, bathroom with bathtub, double vanities, separate shower, water closet, hairdryer, sitting area, complimentary Wi-fi, LCD TV, Mac mini (iPod connection, CD and DVD), telephone, mini-bar, safe and pillow menu. Situated on the North beach of Port Launay, these two-bedroom villas offer the ultimate beachside accommodation. Each is spaciously designed and stylishly decorated with large en-suite bathrooms, a private swimming pool, a pergola for relaxation and aperitifs, LCD TV, Mac mini (iPod connection, CD and DVD), complimentary Wi-fi, mini bar, mini wine cooler with a selection of wine, pillow menu, tea and coffee facilities. The villas with three bedrooms are spaciously designed and stylishly decorated with en-suite bathrooms, a private swimming pool and an outside dining kiosk situated in the courtyard. LCD TV, Mac mini (iPod connection, CD and DVD), complimentary Wi-fi, mini bar, mini wine cooler with a selection of wine, pillow menu, tea and coffee facilities. Overlooking the Port Launay Marine Park, the hillside villas (either one or two bedrooms) feature their own plunge pool and have been constructed and adapted to the granite rocks on site, creating a unique accommodation concept. LCD TV, Mac mini (iPod connection, CD and DVD), complimentary Wi-fi, mini bar, mini wine cooler with a selection of wine, pillow menu, tea and coffee facilities. Villas comprising one bedroom with a spacious en-suite bathroom, private swimming pool, pergola for relaxation and aperitifs, LCD TV, Mac mini (iPod connection, CD and DVD), complimentary Wi-fi, mini bar, mini wine cooler with a selection of wine, pillow menu, tea and coffee facilities. The bathroom is the main focal point as it features both the treatment area and the bath area. The meditation and calm zones of the villa are ideal for relaxation and reading. The bedroom is the retreat area of the villa, encouraging a deep and refreshing sleep. With a breathtaking view of the ocean, the three-bedroom, 980m² Presidential Villa offers a unique experience and comes equipped with LCD TV, Mac mini (iPod connection, CD and DVD), complimentary Wi-Fi, mini wine cooler with a selection of wine, mini bar, pillow menu, tea and coffee facilities. This villa has its own gym, private spa, private pool and deck, and outdoor dining kiosk. 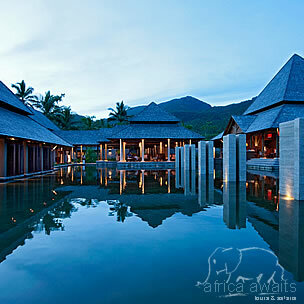 Constance Ephélia Resort of Seychelles has five restaurants and bars. Each outlet has its own individual theme, design and décor, optimising guests’ choices in culinary and bar experiences. Each design reflects elegance and functionality, along with hints of Africa. Each restaurant’s name reinforces its theme. The resort is child friendly and offers different menus to appeal to different ages – including gourmet baby food. The spa is 7 000m² and is set in beautiful tropical gardens. The concept of the Shiseido Pavilion is presented on a grand scale. The spa has been built in harmony with the natural setting and is divided into various islets of beauty and wellness. The Spa de Constance Spirit / Shiseido Pavilion unfolds step by step for the fortunate guests of the 10 Spa Villas. Each one is an invitation to surrender and embark on a sumptuous journey of the five senses. Five boutiques are on the property – two on North beach next to the Villa reception, and three shops on South beach within the main building. One has a line of clothing, Constance Hotels Experience branded items and a few basic day-to-day items. Another showcases a wide range of Seychelles art and handmade craft items. The third shop, called Constance Creations, is where guests can create their own perfume and body creams and where different kind of soaps are available. The kids club is a multifunctional space comprising a games room and a dining area. It welcomes children from 4 to 12 years old between 9am and 10pm. Indoor and outdoor activities are organised daily, as are excursions. A daily programme is available under supervision and children’s menus are available on request. Babysitting can be arranged on request (payable). Free: fully equipped gymnasium, tennis and squash court, non-motorised watersports such as Pedalos®, catamaran, windsurfing and kayaks. Payable: fishing, diving (PADI) with supplement, rent of tennis equipment as well as lessons. Yoga lessons on request. - A 6 night minimum stay will now be applicable over period 23 Dec - 2 Jan. Valid for arrivals from South Africa only. Turquoise seas, pristine white sandy beaches and lush tropical vegetation. If you are an avid nature lover, passionate about fishing or looking for the ultimate diving experience, look no further than the Seychelle Islands. 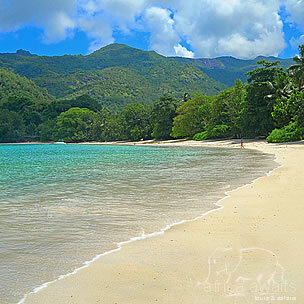 Seychelles is believed to be the most environmentally conscious destination in the world. To preserve this, the number of tourists visiting the island at any time are limited, so you will always be assured of a little piece of paradise to yourself. 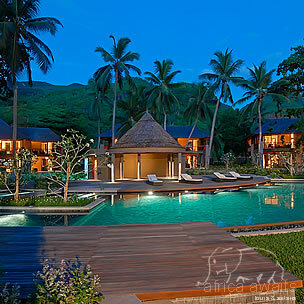 With your holiday, safari or business trip from in to Ephelia Resort in Seychelles.